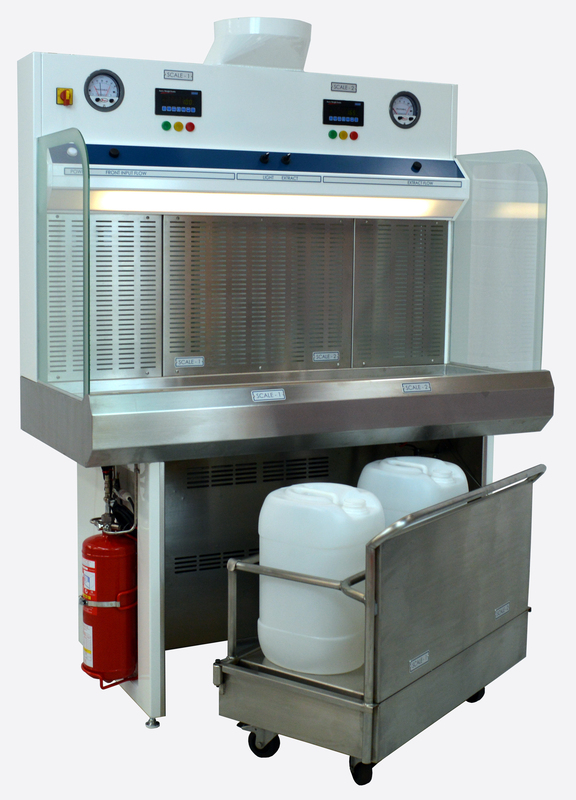 The Ventilated Decanting Workstation is a fully dedicated workstation for the decanting of waste solvent within a controlled extract ventilated environment. The workstation comes equipped with a full access fire suppression system and an ATEX rated weighting platform which is mounted within a swivel carriage for receiver changes. • Fully welded stainless steel worktop for spillage containment with a primary liquid retention bund. • Pouring funnels with back support raised during receiver changes. • When pouring the funnels is in constant contact with the main frame therefore providing earth continuity. • Audio/visual indicators for airflow, both exhaust and input. • Receiver capacity status, in both colour codes and kg weight. • The containment requirements of BS EN 14175 part 2 has been achieved and independently verified.